This summer we plan to highlight several of the participants in the 21st Century Conservation Service Corps (21CSC). Southwest Boston Community Development Corporation is a 21CSC program operator. To view all Faces of the 21CSC stories, please click here. Jhon and Xavier are both entering their senior years in high school. John (right in photo above) has been a member of Southwest Boston CDC’s Hyde Park Green Team for the past 3 years and Xavier (left in photo above) for the past two. The Hyde Park Green Team Youth Jobs and Environmental Education program employs 20-24 Hyde Park youth during the spring, summer and fall. Youth restore Hyde Park’s urban wilds, clean and beautify the Cleary/Logan Square business district and conduct outreach to residents and businesses to engage them in the process. Green Team participants learn landscaping skills and goat care, bicycle safety and safety in the woods. They learn about environmental careers, increase their knowledge of the Hyde Park community and its resources, and gain increased self-sufficiency through earned income. Through collaborative training sessions with area businesses and agencies youth also learn readiness skills including proper workplace conduct, conflict resolution, basic banking and money management, resume writing and interviewing. This year Jhon and Xavier became full-fledged goatscapers. 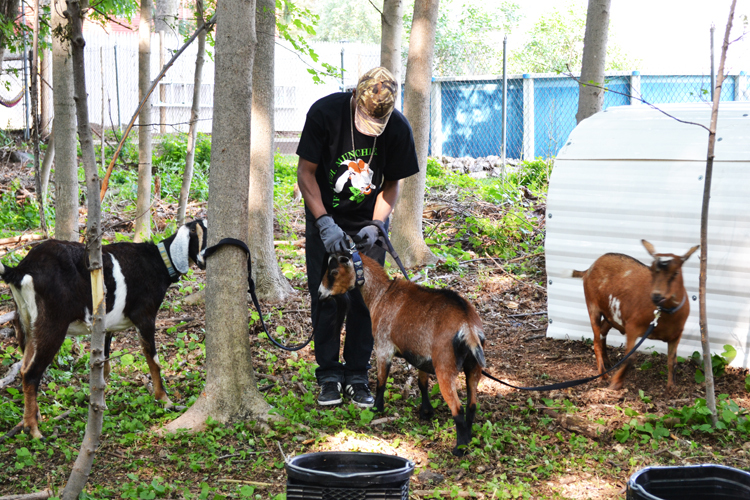 Last year the Green Team began using goats in Boston’s urban wilds as an efficient, cost effective, eco-friendly method of removing poison ivy and other invasive plants, making it safer and quicker for the Green Team to begin restoration projects. Goats eat many invasive plants including Poison Ivy, Buckthorn, Multiflora Rose and Japanese Knotweed. But they will also eat native plants such as roses, saplings or the bark off grown trees. So goats are best used in areas with invasive plants that need to be removed, not in already landscaped areas. 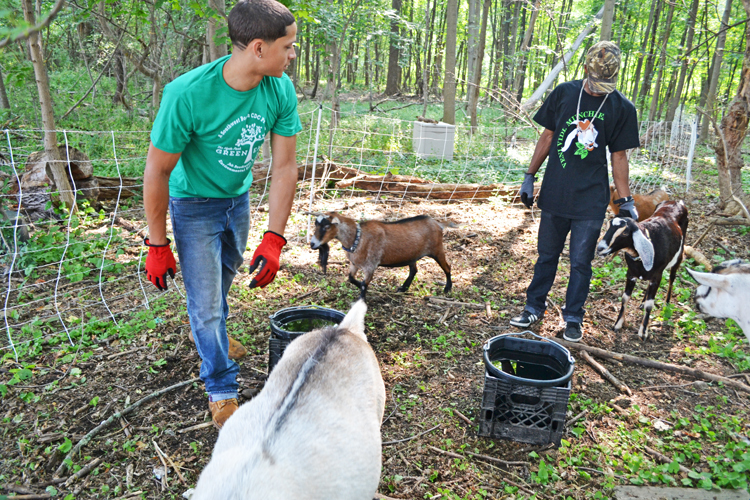 As goatscapers, Jhon and Xavier provide fresh water each day, check the goats for health problems, treat minor injuries and provide supplemental grain or hay when necessary. The goats are enclosed in an electrified fence powered by a solar battery. One-two times per week (when the goats have eaten all the available invasive plants within the fence perimeter) Jhon and Xavier move and reset the electric fencing. This requires measuring out an area of approximately ¼ acre, clearing a path through brush where the fence will be set, staking the fence and attaching the solar battery. This is a challenging and time consuming job when the terrain is difficult, and especially when they accidentally disturb hidden wasp nest or when the one or more goats decide they do not want to cooperate. It takes stamina, creative thinking and team work to get the job done. Jhon and Xavier have proven to be capable goatscapers their first year doing the job. 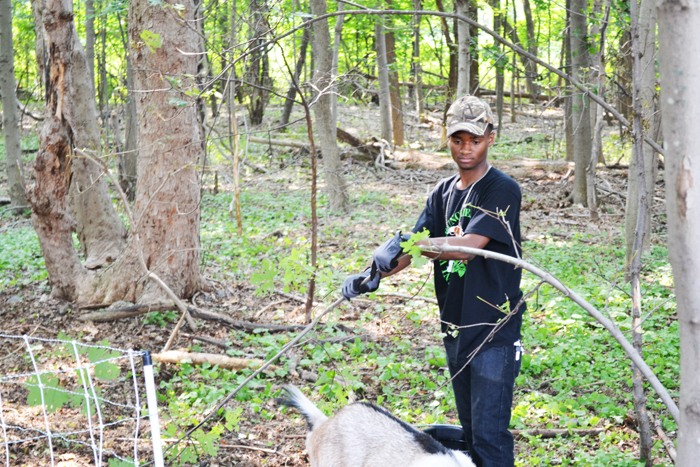 In total, the Green Team has worked with 13 goats this year in 3 separate herds. Why did you join the Green Team? Xavier: “I like to work outside doing physical activity. I also I like to work with a group. I feel good seeing the work we accomplish, and seeing that we come back stronger each year. Also, helping the community is important. Jhon: I want to help the environment, keep the trees healthy. I also want people to be safe. I enjoy working with the group because we can ask questions and share our ideas about how to improve what we do. How did you get to be goatscapers? Jhon: I started as a crew member and was promoted because I did a good job. Xavier: I stared as a crew member. I worked hard and stayed committed so got a promotion. How do you like working with goats? Xavier: This is my first time working with animals. It’s a great experience. The goats are easy, friendly, engaging. They become like family. Also I like the responsibility of caring for them. They are a big part of my life. Jhon: Goats help make our restoration work go faster. It’s fun working with them and having a goatscaping partner. We figure out how to do things together. Xavier: I plan to major criminal justice in college and become a Boston police officer. Jhon: I plan to attend college. I haven’t yet decided what my major will be. This entry was posted in Faces of the 21CSC and tagged Faces of the 21CSC, Goatscaping, invasive plants, Southwest Boston Community Development Corporation on August 27, 2015 by Hannah.